What is imposter syndrome? Have you ever felt like you are in over your depth? In a position in your life or career and you feel like a fake or a fraud? Not feeling up to par and others might find you out? Have you suffered with self doubt and always feeling your not good enough at what you do? Focusing on what went wrong rather than the success you’ve had? If you can answer yes to the questions above there is a chance that you may be experiencing Imposter Syndrome also known as Imposter Phenomenon. An estimated 70% of people experience these impostor feelings at some point in their lives. I’ve worked with many clients over the years that have found this a real and constant struggle. Constantly doubting themselves and abilities. In this article I’ll explain what it is and how to overcome it. 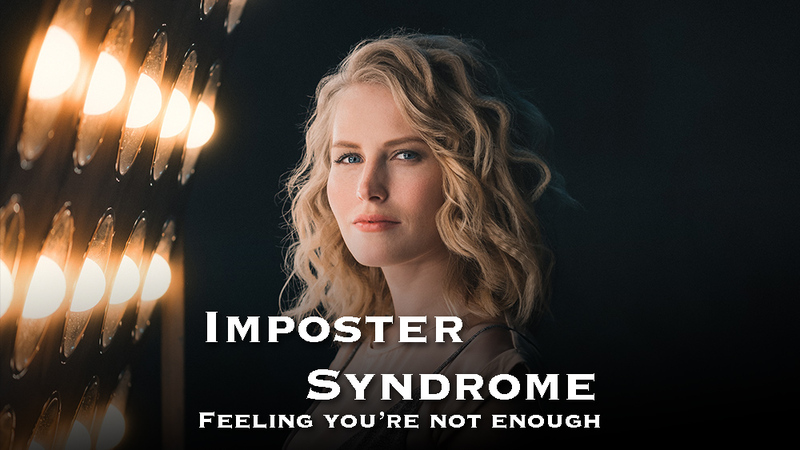 Imposter syndrome also dubbed imposter phenomenon, fraud syndrome or the imposter experience. It is when a person doubts their successes and achievements and has a persistent feeling that they are a fraud and only where they are by chance. It is a thinking pattern that makes you feel you are out of your depth and you fear being caught out. Inner thoughts that you are a fake and an imposter. Impostor syndrome can apply to anyone who isn’t able to internalize or own their successes. A person with this challenge doesn’t see their success or accomplishments as genuine. They think its just a coincidence or it was by chance that this time they had success. Comparing to others and feeling they are better than you is a constant pattern. Having a sense of being found out and afraid to ask questions that may make them look clueless and expose their short comings. For people with impostor syndrome, feelings of guilt often result in fear of success. Sometimes when people speak highly of us like colleagues, or when a parent says you are great. This can lead to an internal belief to live up to the label. This causes pressure and can lead to a person struggling with imposter syndrome to start feeling like a fake and a failure waiting to happen. Feeling that someday they’ll see that your not able nor great at anything. The Perfectionist. They set excessively high goals for themselves, and when they fail to reach a goal or task, they experience major self-doubt and worry about measuring up. They never acknowledge their successes but focus on the failures even if 90% of the job is a success, they focus on the 10% that wasn’t as perfect as it could have been success. The Superman/woman convinced they are a fake among colleagues. They try to be superhuman by pushing themselves to work harder and harder to measure up. But this is just a false cover-up for their insecurities, and the work overload may harm not only their own mental health, but also their relationships with others and work/life balance. The Natural Genius if they take a long time to master something, they feel discouraged. These types of impostor syndrome sufferers set their internal bar impossibly high, just like perfectionists. But natural genius types don’t just judge themselves based on excessively high expectations, they also judge themselves based on getting things right on the first try. When they’re not able to do something quickly or efficiently, their inner alarm bells sound as if something has gone very wrong. The Soloist Sufferers who feel as though asking for help reveals their fake ness. They see asking for help will expose them as a fraud or show them to be clueless. They like to work alone. They don’t ask for help in order to mask their lack of knowledge. The Expert. They measure their competence based on “what” and “how much” they know or can do. Feeling that to do something they must be an expert at it in order to qualify themselves as worthy of doing that task or job. Its based on an insecurity about their intelligence. Know that many others feel the same way and you are not the only one experiencing it . 2: Who are you fooling? Recall to yourself and refocus on your successes and wins in life however small or big they have been. Make a list of what you have achieved that was a success. This helps to tip the scales in a better more positive way. Celebrate successes no matter how small. Remind yourself of what positive feedback you’ve received whether in person or online. Remember the comments that where good. Hold your inner self talk to accountability. For example if you have a task to work on. If the voice in your head says “you are out of your depth”, or “you’re not able to do this”. Catch that talk and reword it. Instead of saying you’re out of your depth, say “I love a challenge, or “the best way to learn is to get stuck in”. Inner chat like “you’re not able”, reword it to “I’m as able as anyone so let’s do this”. Basically change the inner dialogue to something thats more encouraging and will overshadow the negative chatter. Surround yourself with supporters. Those family and friends that encourage and support you. The people who back you and will stick with you. Avoid sharing your plans with those that are negative and not so supportive. Listen and read information that builds your self confidence and helps you overcome self doubt. Learn about those that also experienced and overcame imposter syndrome. Read or listen to true stories of others who succeeded in the area you are feeling like an imposter in. Know that people who don’t feel like impostors are no more intelligent or competent or capable than you. So practice thinking like non-impostor or even imagine how would you think of yourself if self doubt didn’t exist? Imposter syndrome may come back in the future so don’t stress about it. When you discover you can defeat it once you’ll be more confident if there is a next time. Generally imposter syndrome comes when you are out of comfort zone or trying something new. It can come out of nowhere but its usually when we are out of our comfort zone. So don’t fear imposter syndrome, instead when it arises recognise it is because you are growing as a person in an area. See it as growing pains. When you feel like a fraud doesn’t mean you are a fraud. It’s not who you are and even if it happens a lot doesn’t mean it’s true. Remind yourself that its a faulty pattern of thinking and not you’re true identity. The opposite of fraud or fake is authenticity and that is where the answer lies. Be true to yourself and be you. You do the best job of being you and know that being you and being real should be the mantra. Nobody is perfect or has it all figured out. We tend to strive when we decide that the only target to hit is when we do our best. This isn’t being perfect or always trying to be right. Its not overworking or feeling inferior. Instead it is doing our best and living a balanced life and not one consumed with trying to be a success. Authenticity will always stand the tests of time and people like people who are true to themselves. Thinking you are an imposter or fake is actually the real fraudulent thinking. Its simply not true. Thinking you are an imposter is a fake and false belief and not accurate ironically. The fact is you are where you are for such a time as this and that is how it is meant to be. You have a heart beating inside you and that means you are important and valuable because being alive makes you not a fraud, but instead, authentic. Remind yourself impostor phenomenon is not a mental condition, it can be controlled and in time even overcome and defeated. Make sure to connect with Mark on social media for daily tips and inspiration.